Here 3 delicious Recipes for Vegan Pizza and Spaghetti plus a homemade vegan Ceasar dressing to use for the salad. All easy, fast and tasty. 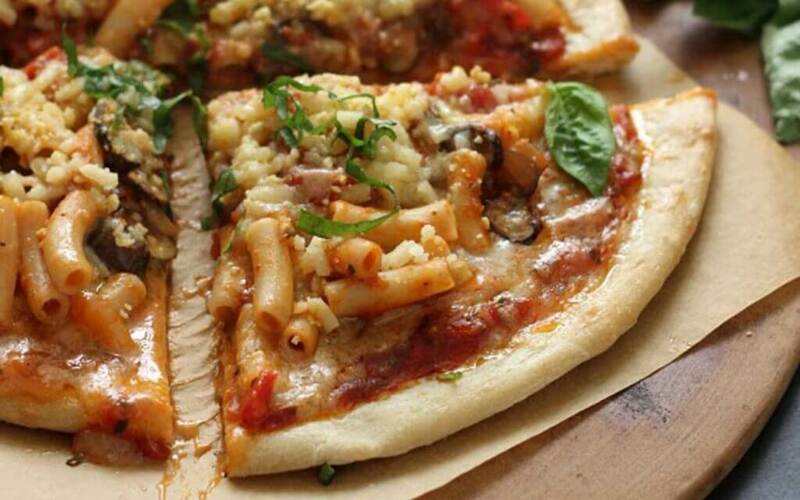 Bake this vegan Ziti Pizza and your own vegan parmesan recipe is here for you as well. The spaghetti squash is made with a delicious fire roasted tomato cream sauce, the name alone is mouthwatering and the preparation takes all together only 50 minutes . The Caesar dressing can be kept and used for 6 servings, best is to have a Vitamix Blender for this, makes it faster to prepare. Ready for a pizza party ? Not only Kids love this . If you love pizza and you love baked ziti, why not try them together? This pizza combines all the goodness of baked ziti with the convenience of a crispy pizza crust! Try making this for the next party you go to, we guarantee that it won’t last long. Drain cashews from soaking water and add to a high-speed blender or a food processor. Add all other dressing ingredients (except salt) and blend on high until dressing is super smooth. Add a splash of water if necessary to help with blending. Taste and add salt and adjust other seasonings as needed. Note: This dressing thickens considerably when chilled, so be sure to leave it at room temperature to soften before using.